A private company in the United Kingdom says it has successfully tested its prototype nuclear fusion reactor at temperatures that are hotter than the Sun. The company hopes to use the nuclear fusion reactor to start supplying energy in 2030. Over the past few years, there have been a number of nuclear fusion breakthroughs, with different teams sustaining hydrogen and helium plasmas for varying amounts of time. We’re still a way off useful nuclear fusion reactors, but it seems we’re taking steps in the right direction. “We are taking significant steps towards achieving fusion energy, doing so with the agility of a private venture, driven by the goal of achieving something that will have huge benefits worldwide,” Jonathan Carling, the CEO of the company, said in an emailed statement. The private company, Tokamak Energy, the is based in Oxfordshire, UK. Their nuclear fusion device is known as the ST40, and it’s the third machine the company has created so far. The ST40 is about the size of a van, compared to much larger fusion reactors seen elsewhere, which are anywhere from the size of a house to a football field. The firm just revealed that it has achieved plasma temperatures of 15 million degrees Celsius (27 million degrees Fahrenheit) inside the device, according to IFL Science. “Reaching 15 million degrees is yet another indicator of the progress at Tokamak Energy and a further validation of our approach. 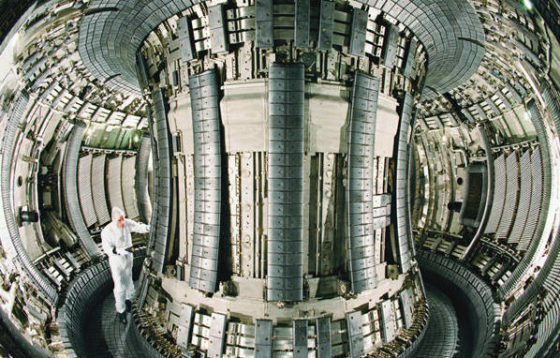 Our aim is to make fusion energy a commercial reality by 2030,” Carling added. There are two major designs for nuclear fusion reactors, both with the aim of twisting magnetic fields and confining the superheated plasma inside. A tokamak does this by using a reactor shaped like a donut and using a large current to twist the plasma. The other design, a stellarator, is shaped like a twisted donut to achieve the same effect. Using a more compact design, Tokamak Energy claims it can achieve higher plasma pressures than conventional tokamaks. It aims to control the plasma with high-temperature superconducting magnets, and eventually start producing useful energy. Their first prototype, the ST25, was built in 2013. They built a second in 2015, and hope to later reach temperatures of 100 million degrees Celsius (180 million degrees Fahrenheit) in the ST40. In 2025 they hope to develop an industrial scale energy device, and in 2030 they hope to start supplying energy to the grid from fusion.